Cerebellar cortex has a very distinctive and uniform appearance across all the folia of the cerebellum. Click on the thumbnail at right for a higher magnification image. The most conspicuous feature of cerebellar cortex is the granule cell layer, composed of vast numbers of very small neurons called granule cells. Each granule cell has a few short dendrites within the granule cell layer. Each granule cell axon projects into the molecular layer and bifurcates into parallel fibers which extend parallel to the long axis of each folium. Above the granule cell layer lies the molecular layer, consisting almost entirely of granule cell axons together with Purkinje cell dendrites (and with relatively few cellsbodies). 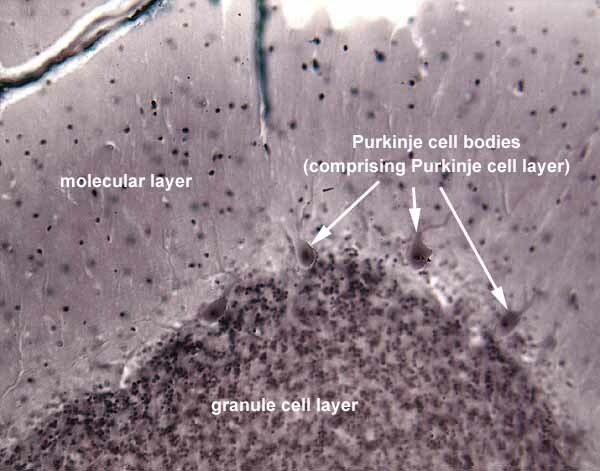 At the boundary between granule cell and molecular layers are found the cell bodies of Purkinje cells, the sole output cells of the cerebellar cortex. Axons enter and leave the cortex through the underlying white matter. See your favorite neuro text (e.g., Kandel et al., 4th ed., pp. 835 ff) for elegant details of neural circuitry in the cerebellar cortex.